Available in versions dedicated to Nikon, Canon and Sony, the Tamron SP 70-200mm f2.8 Di VC USD contains 23 elements in 17 groups. Four of the elements are low dispersion glass (LD) and one is extra low dispersion (XLD). The aperture is constant throughout the range. The name of the lens includes 9 letters indicating various features of the design: SP refers to Super Performance: Tamron’s premium range of optics. Di is “Digitally Integrated Design”, VC is “Vibration Compensation” (not present in the Sony version, since the Sony cameras have IS built in), and finally USD “Ultrasonic Silent Drive”, the autofocus motor. The other specifications are typical of good quality lenses: a 9 blade, round diaphragm and a minimum focus distance of 1.3m. As with most lenses of this size it has a tripod mount on a rotating, removable collar. Generally, the 70-200 focal length range is aimed at genres like sports photography and photojournalism, but the aperture of f2.8 in Tamron’s lens narrows this down as a lens aimed at the discerning amateur or at the professional. The coverage is full frame, again pointing at the upper end of the market, though it will work fine on APS-C format giving an equivalent focal length of 105mm to 300mm (Nikon body, coefficient 1.5); 112mm to 320mm (Canon body, coefficient 1.6). The Tamron SP 70-200mm f2.8 Di VC USD Canon has a DxOMark score of 25. This is the second highest score in DxOMark listings for any zoom lens mounted on a Canon EOS 1Ds Mark III camera and the highest for a lens of this zoom range. The sharpness score is 17 P-Mpix, Distortion is 0.2%, and Transmission at 3.1TStop is very close to the actual aperture of f2.8, which is impressive in a lens with so many elements. Chromatic aberration is 7µm and Vignetting is -1.4EV. These are very good scores indeed, individually there are measures that are beaten by other similar lenses but taken as a whole the Tamron 70-200 is a quality lens. Given that the lens reviewed is the Canon version the most appropriate comparisons are with other 70-200 f2.8 lenses with Canon mounts. There are two others in the market at the moment that have been tested by DxOMark: Canon’s EF 70-200 f2.8L IS II USM and Sigma’s 70-200 f2.8 EX DG APO OS HSM. The specifications for these three lenses are almost interchangeable: the Tamron is fractionally shorter, the Sigma is fractionally lighter but the numbers are very close. The biggest single difference is not unexpected: the Canon lens has an indicative price significantly higher than either the Sigma or the Tamron, seeming to position it apart from the two independent lenses. The measurements for these three lenses are all pretty good but the lens that is set apart from the others this time is the Sigma, because it doesn’t quite match up. The Canon has a DxOMark score of 24, close to the 25 of the Tamron, while the Sigma has a score of 20. When you break the Sigma’s scores down further none of the individual measures is best, Sharpness at 14P-Mpix being the worst. The Canon and the Tamron are close in all measures except for Chromatic aberration where the Tamron and Sigma are good at 7µm while the Canon is exceptionally good at 3µm. Vignetting scores for the lenses show differences but not massive ones and all of them could be corrected easily with DxO Optics Pro. A comparison with the equivalent lenses from other makers: Nikon and Sony gives a much more clear-cut picture. Again the specifications are very similar, even the prices are closer, but the Nikon AF-S VR Zoom-Nikkor 70-200mm f/2.8G IF-ED which has been on the market since 2002 and the Sony 70-200mm F2.8 G since 2006 and both fall well short of the Tamron in performance. The big disappointment is in sharpness: the Nikkor scores 13 P-Mpix and the Sony 13 P-Mpix. As sensor resolutions get bigger this is quite a sacrifice to be making. Nikon has a newer version of this lens too – the Nikon AF-S NIKKOR 70-200mm f/2.8G ED VR II – which will be reviewed soon. Maybe Nikon will have made improvements that will change these findings. Here the comparison at full aperture and 200mm shows a clear advantage to the Tamron lens. 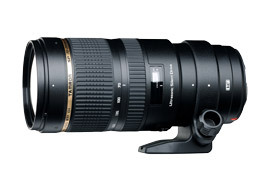 Tamron is not new to having a 70-200mm f2.8 lens, its previous version, the SP AF 70-200mm F/2.8 Di LD (IF) MACRO Canon has been on the market for 5 years. It isn’t a bad lens and it does have a macro facility that, for some people will still make it preferable, it is also much cheaper. However, it isn’t as sharp, and has no image stabilisation, two of the things that make the new lens so good. When comparing with the older Tamron lens at its worst setting the newer lens is about 10% better. If you work with Canon camera body and you are looking for a “sport reportage” zoom then there are two that float to the surface as good choices to make: The Canon EF 70-200 f2.8L IS II USM or the Tamron SP 70-200mm f2.8 Di VC USD Canon. The Canon has a slight edge in sharpness and is more consistent across the range but it is much more expensive. The Tamron lens is very good and while it isn’t cheap it is exceptionally good value. If on the other hand your gadget bag contains Nikon or Sony cameras; and assuming that the performance of this very accomplished lens is similar in the Nikon and Sony versions to the results we achieved for the Canon version, then the decision should be much easier: Tamron all the way.